Africans have long been masters of utilizing whatever materials are at hand to create functional works that are now considered art. In 1992 a group of South African natives located in the geographical region known as Inkwenkwezi, furthered this tradition by ingeniously crafting highly attractive bracelets from discarded recycled material. 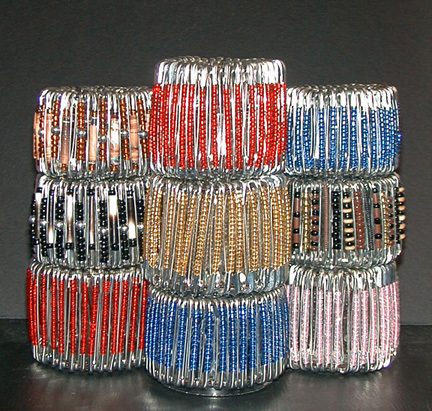 The bracelets are stylized from shiny steel safety pins, tiny colored beads, telephone wire and elastic! The selections are all expandable to fit virtually any wrist size. The wide variety of colors can match or add a tasteful accessory accent to any attire. The popularity from gaining world-wide recognition for these bracelets have enabled many impoverished women to gain financial independence whereas they can now provide support for their families. We here at Authentic Africa would like to keep the spirit of enriching lives alive. We will continue to provide revenue for these South African women by purchasing their merchandise.